Lake Waiau is another of the great mysteries of the Big Island. 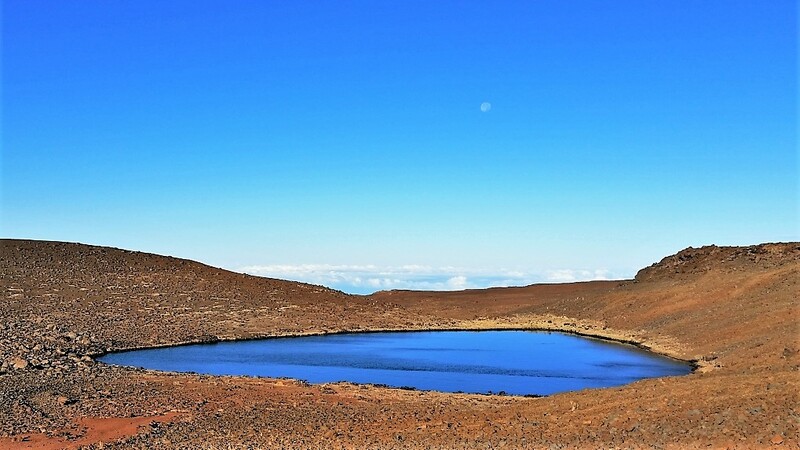 Located high on Mauna Kea at an elevation of 13,025 feet (3,970 meters), this is the highest lake in the US outside of Colorado or Washington. The mystery lies in its very existence. 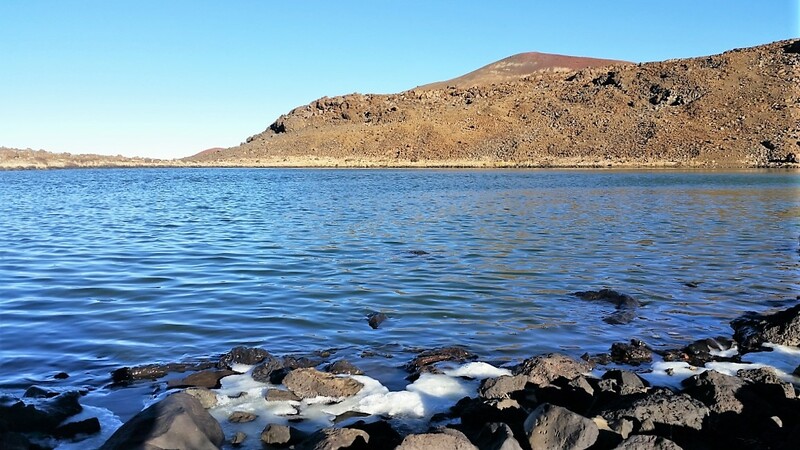 With very porous volcanic soil at an elevation where there is no real "runoff" to feed the lake, scientists are baffled that it is here at all. Annual rainfall is less than 15 inches at the Mauna Kea summit. The water in the lake should seep through the lava rock, but it doesn't. Waiau, which means "swirling waters" in Hawaiian, was formed about 10,000 years ago during the last ice age. Today it is fed primarily be snowmelt. The lack of drainage is believed to be caused by a bed of clay and dense volcanic ash beneath the lake. Don't underestimate the challenge of this hike! Despite it being a relatively short trail to the lake, you are sure to feel the impact of the extreme altitude. It is critical to stop at the Visitor Information Station at 9,200 feet (2,800 meters) for at least 30 minutes to allow your body to begin acclimating before ascending higher. Common signs of altitude sickness include feeling light-headed, dizzy, nausea and headache. If you feel any of these symptoms, stop immediately. Drink plenty of water before your hike and remember to take water with you. To begin your hike, look for a parking area on the right side of the road, 6.6 miles beyond the Mauna Kea Visitor Information Station and less than 2 miles from the summit. After parking, cross to the left side of the road. A nearby sign indicates a boot scrubber on the ground, provided to clean foreign debris from your shoes. Please use it before and after your hike to limit the introduction of invasive particles. Follow the trail less than 3/4 mile (1.2k) to the lake. Take your time with frequent stops along the way. Do not attempt in inclement weather or if there are low clouds or fog. It's easy to lose the trail. Also be prepared for cold. Sturdy shoes, warm clothes, hat and gloves are essential. A short climb up the ridge to the west of the lake reveals just how close you are to the Mauna Kea summit, with the telescope observatories visible just beyond the ridgeline. Like all of Mauna Kea, Lake Waiau is sacred to Hawaiians. Please respect by not disturbing the lake, taking only photographs and leaving only footprints. 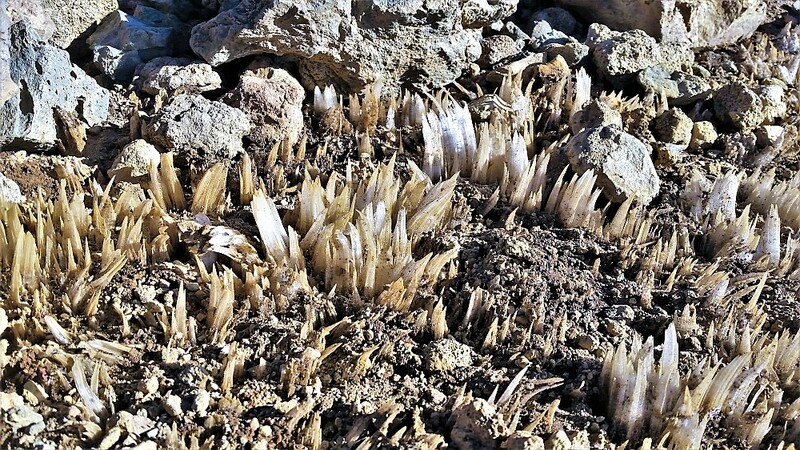 Depending on when you go, you may hear the familiar crunch of "needle ice" breaking under your feet as you hike high on the slopes of Mauna Kea or Mauna Loa, particularly during winter months. Needle ice is formed when the soil temperature is above freezing and the surface air temperature is below freezing. Sub-surface water rises above the soil and produces needle-like columns of ice. Because a 4-wheel drive vehicle is required and the trail is not well defined, make it easy on yourself by going with an experienced guide. Sign up for a private tour! Includes a stop at the Mauna Kea Visitor Information Station and continues to the Mauna Kea summit.